Florence versatile™ 4C mailboxes meet or exceed STD-4C requirements for new construction and major renovations. They are also ideal for private delivery applications. 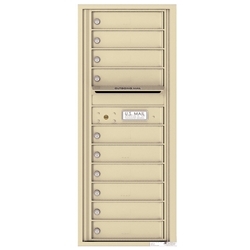 Height: Unit height is 44-1/4"
Front-loading 4C mailbox includes a master access door with Private Lock for delivery/service to mailbox. Silver adhesive decals with black numbers 1 thru 10 are included for door identification.